Greg Yeomans Wins NEPGA Cape Cod Chapter Player of the Year! For the second year in a row, Bay Club Head Golf Professional, Greg Yeomans captured the Cape Cod Chapter of the New England PGAâ€™s Wessner Player of the Year Award! Earning points for his performance in Cape Cod Chapter events played throughout the year, Greg surpassed the second place finisher by 65 points. Highlights of the season included winning both Cape Cod Chapter Majors – the Chapter Championship played at New Seabury and, for the third year in a row, the Chapter Match Play played at the Golf Club of Cape Cod. Â Contributing to the overall results were severalÂ Pro-Am team events, of which Bay Club members were able to join Greg as he defended his title. In addition to Gregâ€™s performance on the course, he was recently elected Cape Cod Chapter President after previously serving as the Tournament Chair this past season. Greg recently sat down with Goldie ofÂ Â 95.9 WATD’s Goldie Bounce Golf host Liza Churchill for a friendly chat about his year and the future of the NEPGA. To listen to the interview please click on the gray bar at the bottom of this post. Congratulations Greg on a great year on the links! The Bay Club at Mattapoisett is a country club with an eighteen hole championship level golf course and residential property located in Southeastern MA.Â Â To arrange a private tour please contact Dave Andrews via e-mail or phone, 508-758-9543. Each year around the holidays, the Bay Club joins together with the community to create an Angel Tree at the club.Â The tree holds angel ornaments for the members to “adopt”,Â each identifying a local childâ€™s needs and wishes for the holidays.Â Established in 2007, the Bay Club Angel Tree has supplied hundreds of gifts to local childrenÂ during the holiday season.Â Members purchase and wrap gifts for their selected angelÂ and put them under the tree until they are distributed to the children at the appropriate time. 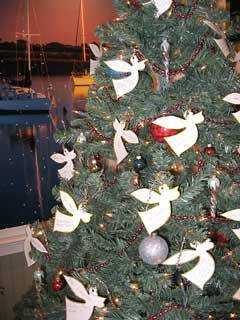 The Bay Club at Mattapoisett is chock full of special events this December; many of which have become family traditions. The Holiday Wreath Workshop starts off the holiday season when local favorite Chad Michael Peters offers his assistance and a vast assortment of materials for members to create their personalized holiday masterpiece for doors, mantles or tabletops. The young members of the Bay Club are treated to an incredible Gingerbread House Workshop. 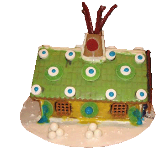 Willie Wonka himself could not provide a more elaborate spread of confections used to adorn the prebuilt houses. Generations of family members gather to enjoy the process and welcome Santa to the Bay Club! Traditionally, a group of Bay Club members plan a trip to Boston to attend a Boston Holiday Pops performance. This year, however, the venue has been revised and the group heads to the New Bedford Symphony Orchestra as two of the young members of the club will play in the Family Holiday Pops performance! Nestled in between the family events is a member holiday party where Chef Mercer outdoes himself each year with an amazing offering of holiday fare. The Bay Club at Mattapoisett is a country club with an eighteen hole championship level golf course and residential property located in Southeastern MA.Â Â To arrange a private tour please contact Dave Andrews via email or phone, 508-758-9543.